The blusher comes packaged in a square, shiny, rose-gold box. 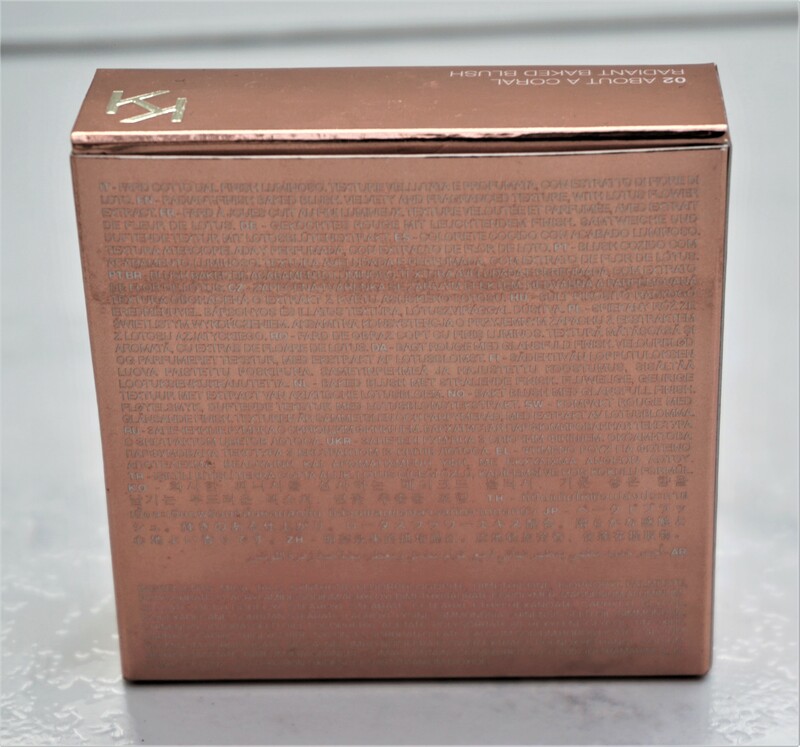 The front of the box has gold and white writing providing the brand name, product name and product weight (8g/0.28oz net weight). The top of the box provides the shade name, the product name and the brand logo. The back of the box provides information in various languages on the product inside, as well as the ingredients. 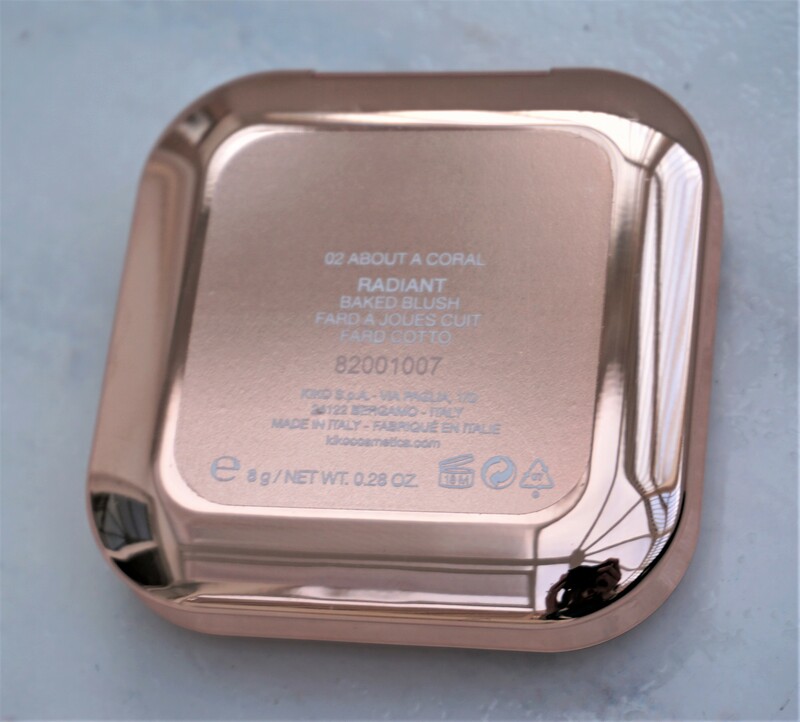 The box states that box contains a “Radiant finish baked blush. Velvety and fragranced texture, with lotus flower extract”. 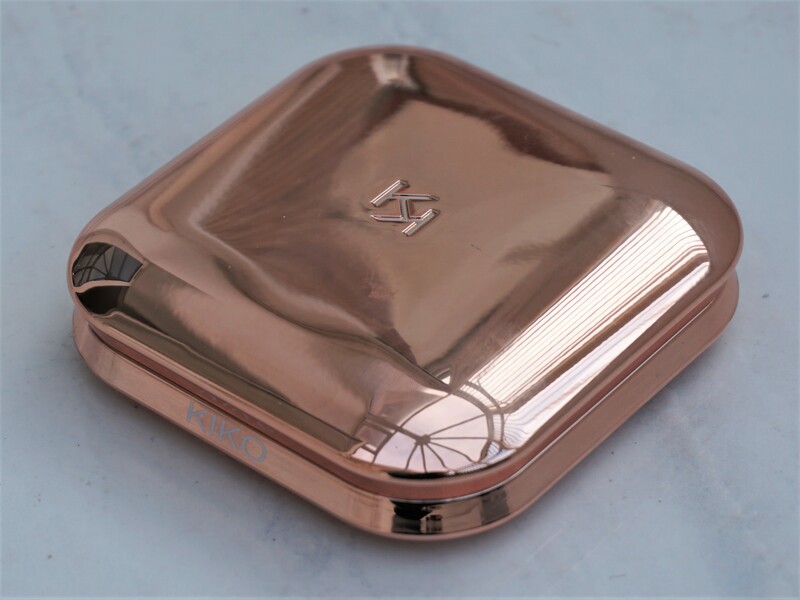 The blushers come packaged in a gold compact featuring Kiko’s classic square packaging and rounded edges. The edges of the compact have ‘Kiko’ inscribed in white lettering. The compact feels very smooth and luxurious to the touch. The product has a nice weight to it; lightweight, not flimsy and easy to hold. The back of the compact provides the shade name, product name and net weight (8g/0.28oz net weight). The blusher has a mirror in the top lid and the product in the base. The mirror is a really good size, in that it fills the inside of the top lid. The mirror size means that you could easily use it to top up your blusher or apply other make-up products on the go, like your lipstick or eyeliner. The blusher is encased in the bottom section of the compact. The blusher has a marbellised effect, with a mix between a coloured blusher shade and swirls of a light, luminous cream colour. 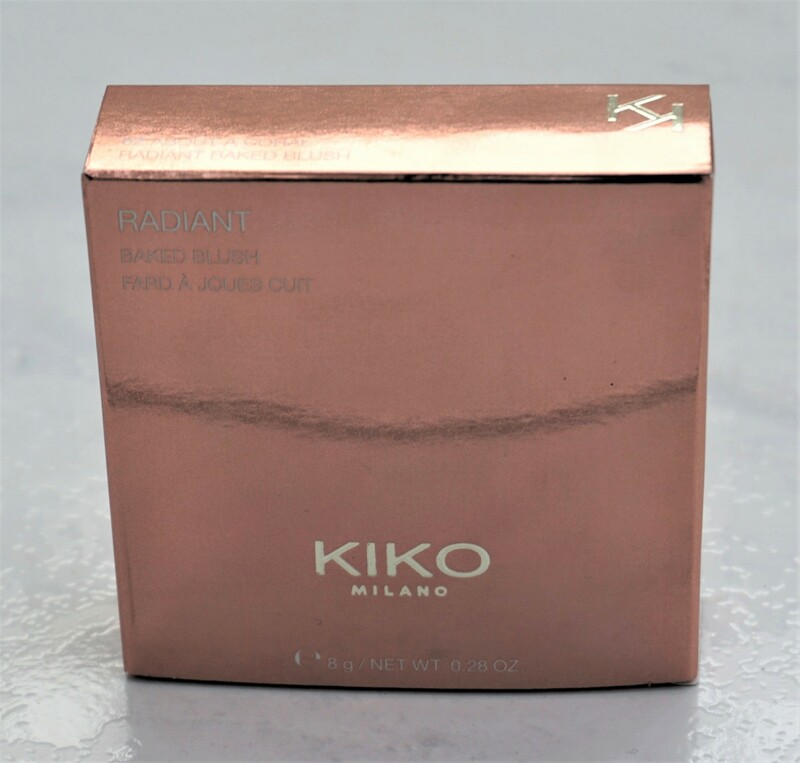 Kiko describes the Radiant Baked Blushes on their official website as having “…rich, pigmented colour pay-off”. 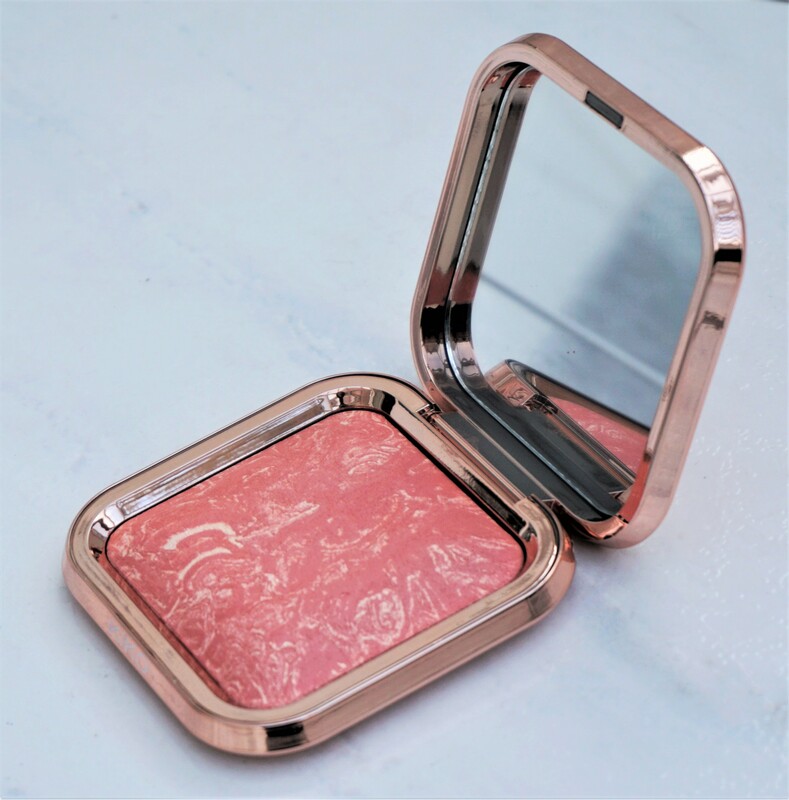 They state the blushers are “Perfect for revitalising the complexion and giving the skin a fresh, natural and healthy glow” and that they are good for “gently highlighting the complexion”. Kiko states that the blushers have “a lightweight and velvety formula that feels good to apply”. They state that the blushers are “…embellished with an elegant, marbleised effect thanks to highlighting micro pearls that create a unique design”. The blushers are also claimed to impart “…a luminous finish with buildable results”. I think that this blusher is absolutely beautiful, in that it gives a wonderful, glowy and natural effect to the cheeks. The marbelised design works well, as the blusher colour seems to meld with the lighter swirls to add a luminous finish to the cheeks. The swirls give such a beautiful glow that you can skip highlighter if you are in a rush and still get a radiant finish. 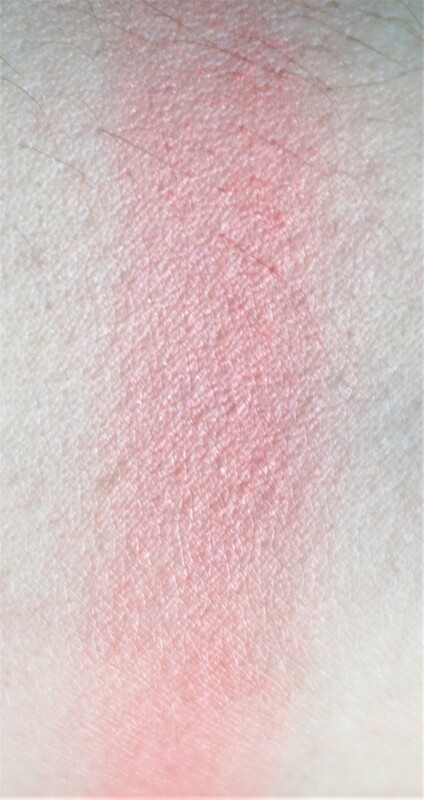 The blusher feels very lightweight, silky to the touch and blends effortlessly on to the cheeks. The formula is buildable, in that you can use a little to add a fresh flush to the cheeks or you can add more for a stronger effect. 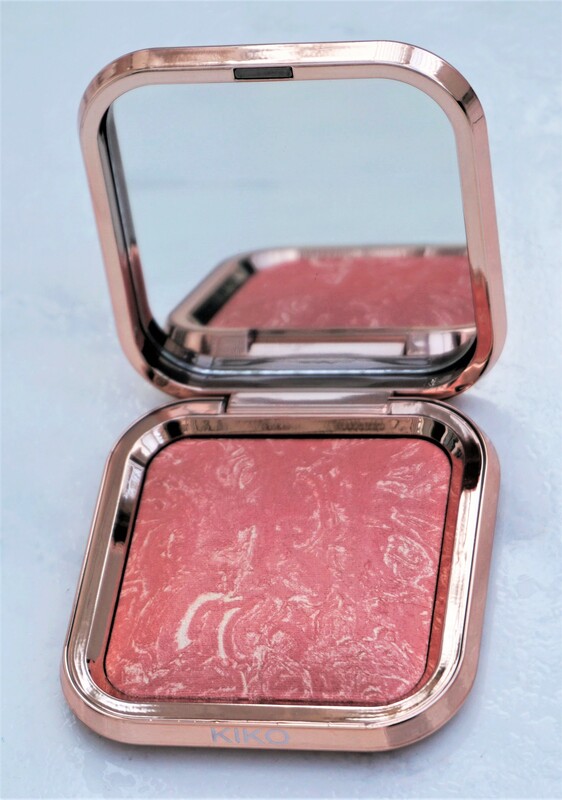 The baked blushers are described as having a “Soft and scented formula, which is enriched with lotus flower extract”. I find the scent to be quite strong and flowery when I open the compact and apply it to my face. I get some lingering scent just after application but the smell dissipates after that and I don’t smell it through the day. I enjoy scent in my make-up products but I find the lotus flower scent here a little too perfumed for my taste. I don’t know if it is because they have a flower-based scent but the smell can be a little over-bearing when I open and use the product. The scent doesn’t linger, though, which means that I still enjoy using the product. Despite the scent on application, I love the blusher colour, pigment and finish so it doesn’t put me off using the product. I would have preferred for the blushers to not be scented – at least with a flowery-based smell – as I think they look beautiful on the cheeks without the need for any added fragrance. The Kiko Baked Blushes are available in two shades: 01 Up To Mauve and 02 About A Coral. I picked up 02 About A Coral, which is a really pretty peachy-pink colour. I think the blusher pulls more peach and pink, than coral, as I don’t see much coral or orange tones coming through in the colour. About A Coral gives a very fresh, healthy peachy-pink glow to the cheeks. The lighter swirls add a subtle glow and luminosity to the cheeks. The overall effect is very soft and candlelit, rather than being bright and shiny. 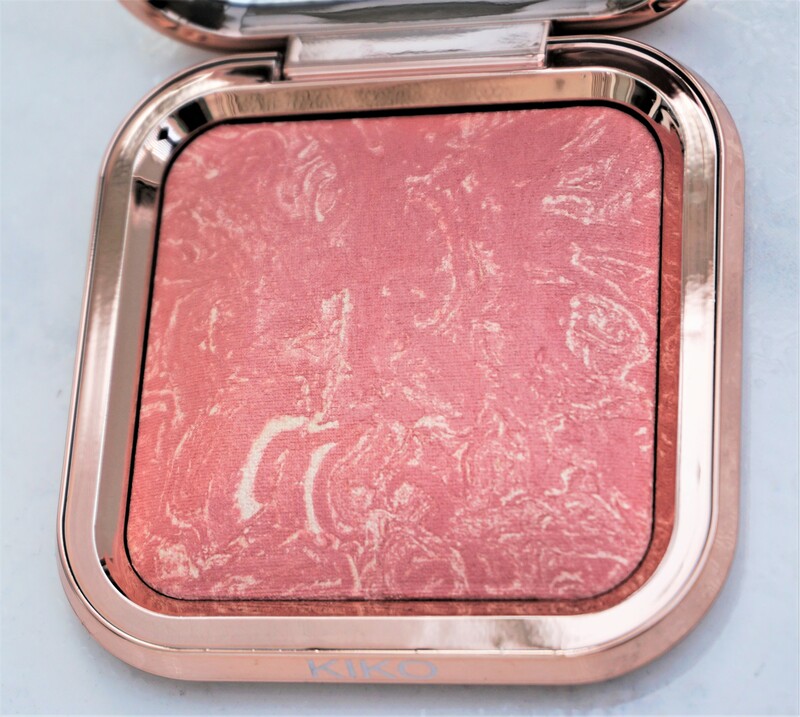 Kiko Radiant Baked Blushes as a Dupe for Hourglass Ambient Lighting Blushes? The Kiko Radiant Baked Blushes remind me a lot of the Hourglass Ambient Lighting Blushes. I have one Hourglass blush and whilst it isn’t totally the same as the Kiko product, I can see some similarities. The luminous effect comes through to me just as beautifully as in my Hourglass one. The blusher colour section melds beautifully with the highlighting swirls to give cheeks a beautiful, fresh and luminous glow. Both products have a swirl type design, with a blusher colour and a luminous, lighter highlighter shade. The marbelised pattern is different in both blushers but I find the overall effect on the cheeks to be very similar. The two products are quite different size wise, price wise and scent wise, so there are some differences. To summarise, the Kiko product is a lot bigger than the Hourglass one (8g/0.28oz vs 4.2g/0.15oz), cheaper (£14.90 vs £35) and has a strong flowery scent (the Hourglass one is unscented). I think it would be interesting to compare both products, so let me know if you would like to see a comparison post! Kiko Radiant Baked Blushes are available from Kiko stores and the official Kiko website. The blushers cost £14.90 each. 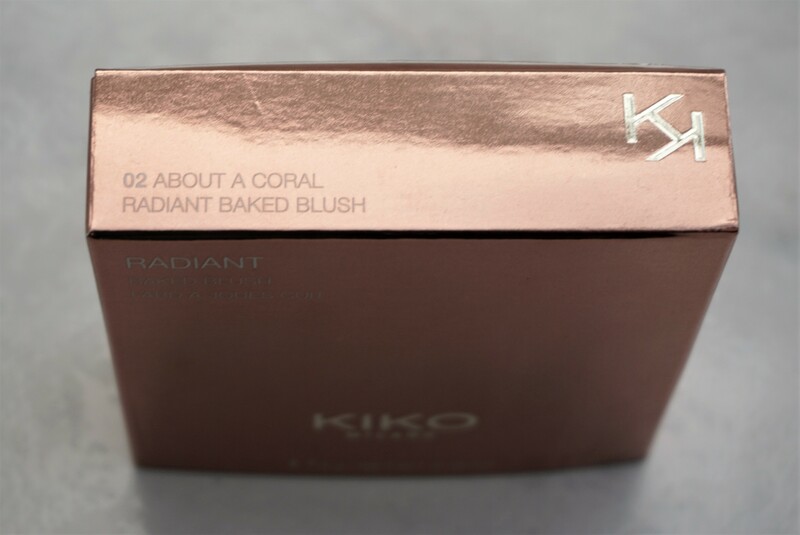 Have you tried the Kiko Radiant Baked Blushes? What do you think of them? Do you have the Hourglass Ambient Lighting Blushes and if so, how do you think they compare to the Kiko product? Let me know in the comments section below.